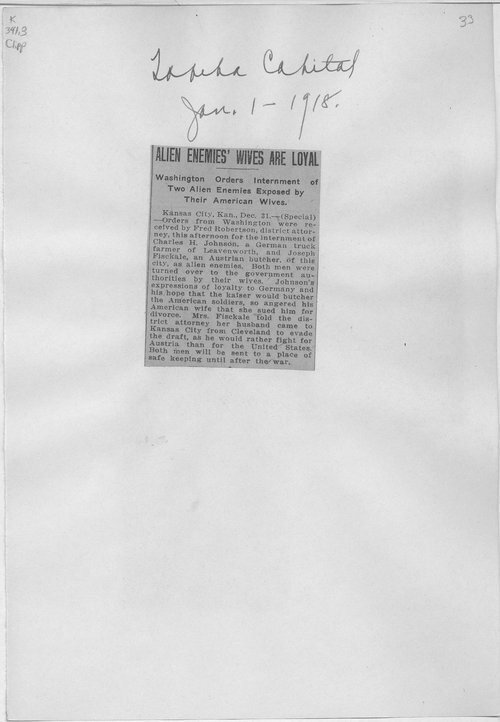 This article printed in the Topeka Capital details an incident involving Charles H. Johnson and Joseph Fisckale, both of whom expressed sympathies for the Germany and Austria. Turned in by their American-born wives, Johnson and Fisckale were "sent to a place of safe keeping until after the war." This article helps students understand the limits placed on the freedom of speech during World War I and it's impact on so-called disloyalists within the German American community. Call Number: K 341.3, Clipp., v1, p. 1-123, Sedition, espionage, etc.